Attend our 2019 regular meeting on Tues., March 26! The meeting will be held from 10 a.m. to noon at the DeKalb Board of Health Office, Bohan Conference Room, 445 Winn Way, Decatur, GA. Parking is available on-site. Agenda is forthcoming, we hope to see you there! Thanks to all who came to the 2018 Fall Meeting! The Georgia Food Safety Task Force co-hosted this event with the Georgia Association of Food Protection on Sept. 26, 2018, at Sweetwater Brewery's Reel Room in Atlanta. 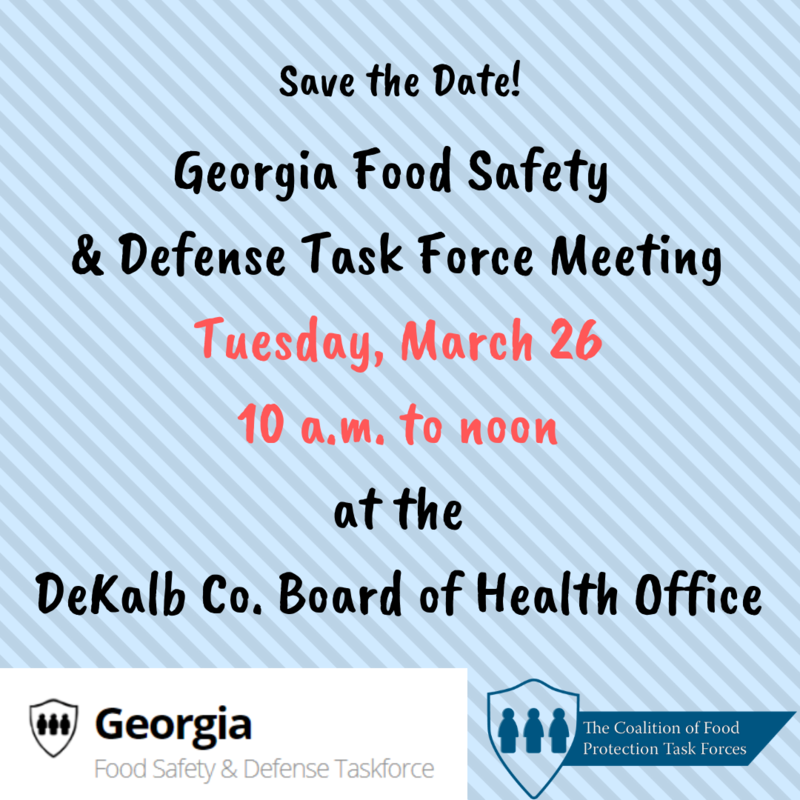 Given the shared mission, goals, and objectives of both GaFSTF & GAFP, this joint meeting was aimed at further building the network of food safety professionals in Georgia while creating a forum to share information, knowledge, and tools to advance food safety. This meeting had limited space, and the 100 seats sold out in record time! We hope to offer collaborative meetings in the future when time & space allow. More details including a link to listen to a recording of the meeting is available on our Meeting Minutes page. This conference will be held at the Emory Conference Center Hotel in Atlanta. Early bird registration is available through Oct. 2017 here. Durham, NC The North Carolina Food Safety & Defense Task Force is hosting their 9th annual training conference event in Durham. Get more details by emailing cbacon@mindspring.com. June 12-14, 2019 GA Environmental Health Association Annual Conference Stone Mountain, GA GEHA's AEC training event will be held this year at the Evergreen Marriott within Stone Mountain Park, Ga. All event details & registration will be posted at www.geha-online.org. The summit brings together leaders from government, academia and industry for comprehensive coverage on pathogen detection, point-of-care, bio-surveillance, sample prep technologies, and bio recovery. Details here. This annual meeting brings together 400+ regulatory professionals in the food, drugs & device arena. This year's meeting is being co-hosted by AFDOSS, the regional southeastern affiliate. All details are available here.